Proposal sheds "City Place" name, now "Heritage Row"
Previous versions of the project would have either demolished the seven houses or preserved them only in part. Now, the plan is to rehabilitate those houses to historic district standards. To achieve the tax credits necessary to help fund the project, the area would need to be declared an historic district. In August, the Ann Arbor city council established a study committee to explore the question of whether an historic district would be appropriate for an area along Fourth and Fifth avenues. The area of study includes the proposed Heritage Row. Given the tax credits that would be available to help fund Heritage Row, it would now work to de Parry’s advantage if the study committee recommended to city council that the area be established as an historic district. Based on two meetings of the historic district study committee attended by The Chronicle – most recently on Dec. 1 – that committee’s challenge is not so much whether to recommend their assigned area of study as an historic district. Rather, the conundrum they face is whether to recommend as an historic district a region that’s larger than the study area. The next step to bring the Heritage Row project forward appears to be for de Parry and his team to formally notice a meeting in order to meet the requirements of Ann Arbor’s citizen participation ordinance. The question arose during Monday’s meeting as to whether the meeting was a continuation of the August public participation meeting. Some of the dozen residents who attended the Monday presentation did not embrace the new name of the project, Heritage Row, saying it was too ironic. “Is it /ro/ or /rau/?”asked one resident pointedly. Jan. 15, 2008: Conditional rezoning – Ann Arbor Planning Commission recommended denial. YES: None. NO: Bonnie Bona, Craig Borum, Jean Carlberg, Ron Emaus, Joan Lowenstein, Eric Mahler, Ethel Potts, Evan Pratt, Kirk Westphal. May 20, 2008: PUD (planned unit development) – Planning Commission recommended denial. YES: Emaus. NO: Bona, Borum, Carlberg, Lowenstein, Mahler, Potts, Westphal. ABSENT: Pratt. Sept. 4, 2008: PUD – Ann Arbor Planning Commission recommended denial. YES: Borum, Lowenstein. NO: Bona, Carlberg, Potts, Pratt, Westphal, Woods. 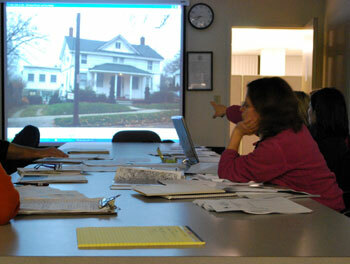 Dec. 15, 2008: City Council rejects resolution to establish a Historic District Study Committee for Germantown. 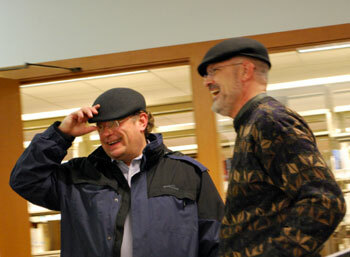 Jan. 5, 2009: PUD – City Council denied on a unanimous 0-10 vote. NO: John Hieftje, Sabra Briere, Tony Derezinski, Stephen Rapundalo, Leigh Greden, Christopher Taylor, Margie Teall, Marcia Higgins, Carsten Hohnke, Mike Anglin. ABSENT: Sandi Smith. April 21, 2009: MOR (matter of right) – Planning Commission recommends approval on 6-3 vote. YES: Bona, Carlberg, Derezinski, Mahler, Westphal, Woods. NO: Potts, Borum, Pratt. July 7, 2009: MOR – Planning Commission recommended denial on 5-1 vote to approve (needed 6). July 20, 2009: MOR – City Council postpones until January 2010, to give the developer the opportunity to pursue a revised PUD. A condition was that the developer could bring back the matter of right project with 35-days notice. Aug. 6, 2009: City Council establishes an Historic District Study Committee and moratorium on demolition for a two-block area, including the proposed site of City Place. Aug. 11, 2009: “Streetscape PUD,” a revised version of de Parry’s project, receives planning staff initial review. Aug. 12, 2009: “Streetscape PUD” introduced to neighbors to comply with the neighbor participation ordinance. Aug. 17, 2009: City Council revises language of moratorium to include all forms of work, including demolition. Aug. 30, 2009: Application for “Streetscape PUD” was not accepted by city planning staff. Sept 21, 2009: City council approves MOR project, but it cannot move forward because of the moratorium on demolition passed together with the historic district study committee. Oct. 12, 2009: Update given by de Parry on “Streetscape PUD” at Conor O’Neill’s. Dec. 14, 2009: Update given on “Streetscape PUD” – now called “Heritage Row” – at Ann Arbor District Library. At the time of the Monday meeting, only bird’s-eye view schematics were provided, but the development team said that street level elevation drawings would be available soon. 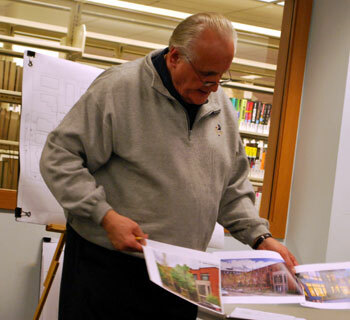 The presentation of Heritage Row was made by John Dziurman, an architect specializing in historic preservation. 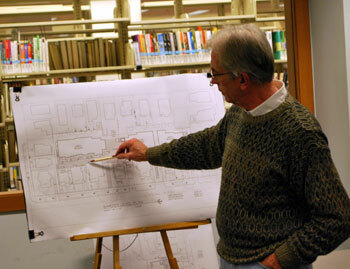 He introduced himself as a member of the Rochester Hills historic district commission, having also served on the historic district study committee to establish a district in Rochester Hills. He cautioned that he was not out to turn Ann Arbor into Rochester Hills. The three buildings to be constructed behind the row of houses, said Dziurman, would not be designed to mimic historic buildings – Secretary of the Interior standards require that new buildings and additions be “differentiated” from the old buildings so that the historical record is not confused. Instead of trying to create buildings that could pass for old, Dziurman said that he would design contemporary buildings to be suitable “background buildings” that were complementary to the houses. “The Washtenaw” is a brick apartment building in the area that he’d draw inspiration from. Each of the old houses would have a new foundation built, and some would be brought forward to form an even 19-foot front setback. The space between the three new buildings to the rear and the row of seven houses would become a paved plaza area. Residents of the seven houses would have access from the rear of their houses to that common plaza area. Some people attending Monday’s meeting complained that a similar plaza-type arrangement at Ashley Mews had not resulted in people actually using it – it was a dead zone, they said. One resident couple, however, said they enjoyed walking their dog through Ashley Mews. The paving material for the plaza, Dziurman said, would be permeable. One resident questioned how that might work, given that underneath the plaza there’d be an underground parking structure. Architect Bradley Moore, who’s also working on this project, gave assurance that it could work. The underground parking, said Dziurman, with its 60 spaces, would relieve some of the parking burden in the area. But whether it would relieve the burden, said one resident, would depend on how many units were being built. De Parry broke down the units in the new buildings like this: 34 2-bedroom units and 10 3-bedroom units, for a total of 98 beds in new construction. Including the seven houses, that would put the total number of beds at 163. Residents wanted to know how large the bedrooms would be – were they large enough to accommodate two people? Moore said that they were mostly 10 feet by 11 feet. De Parry concluded that they were not intended to be doubled up. For attendees, Ashley Mews was also a standard of comparison for the height of the three new proposed buildings. Moore reported that the current height proposed would be no taller than the tallest point of any of the seven houses – 38.875 feet. One resident said she’d be a lot happier if one story could be lopped off those buildings. Sabra Briere, who represents Ward 1 on Ann Arbor’s city council, asked, “What about four feet?” She pointed out that sometimes a difference of as little as four feet could make a difference in how a building was perceived. Moore replied, somewhat wistfully, that making the building four feet shorter would require him to specify 6-foot ceilings. The rear access to the plaza from the houses, said Dziurman, would be made possible by modifying the rear of the houses. Some of those houses had had additions put on over the years. De Parry described a variety of modifications that would be made to the rear of each house. The restoration of the rear of the houses, Tom Whitaker pointed out to Dziurman, would need to be made according to the period of historical significance for each house. Dziurman agreed, and said that to some extent they’d need to wait until the historic district study committee returned its report and recommendations. Whitaker serves on that committee, which has met at least four times this fall and is on course to submit a report sometime in February. That study committee was established by the city council on Aug. 6, 2009, and includes a moratorium on all work, including demolition, in the area of study, which includes the site of Heritage Row. Sabra Briere, Ward 1 councilmember, said that she could not say for certain what would happen, but could say what ought to happen. The project should move through the process up to the point where the planning commission and the city council gave their verdict on it. The danger, she said, in having the planning commission and the city council give approval before the historic district commission weighed in was that the historic district commission might still deny the project. Whether there is an historic district established will depend in part on what recommendation is made by the historic district study committee. And based on the two meetings of that committee that The Chronicle has attended, it’s not clearcut what recommendation will be made. 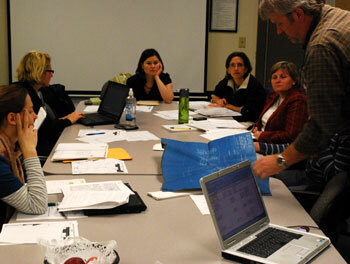 The committee, which was appointed by the council at its Sept. 8, 2009 meeting, consists of Ina Hanel-Gerdenich, Susan Wineberg, Sarah Shotwell, Patrick McCauley, Rebecca Lopez Kriss, Tom Whitaker and Kristi Gilbert. By their mid-October meeting, the committee had already made significant headway in researching the properties in the study area. They’re using a combination of digital and analog tools to complete the work. On the digital side, some of the old city directories are available on Google Books. [List of Ann Arbor city directories available on Google Books] The committee is also using a shared Google spreadsheet to compile all the information they’re gathering. On the analog side, they’re using hard-copy city directories and Sanborn maps. They’re also walking the area and taking new photographs of each property from multiple angles. At the October committee meeting, there was discussion of researching properties outside the mandated area of study. They eventually decided to look at properties south of Packard Street – outside their mandated area of study – acknowledging that this would represent a fair amount of work. That decision was based in part on the idea that it was impossible to make a recommendation of a boundary without knowing what was on the other side. By their Dec. 1 meeting, the committee’s research on Fourth and Fifth avenues extending down south of Packard to Madison Street was in large part complete. However, at that meeting, the historic district consultant for the city, Kristine Kidorf, asked the group to go through the properties in the expanded area parcel-by-parcel to confirm that those they’d designated as potentially contributing to an historic district really fit that description. So that they did, house by house. As their discussion of individual properties wound down, Patrick McCauley, who also serves on the city’s historic district commission, expressed concerns about recommending an historic district to the city council that stretched the boundaries of the area they’d been asked to study. Some of that “fighting it out” would involve a second development in the area. A district expanded down to Madison street would include the area of a development now named “The Moravian.” [Chronicle coverage: "The Madison Redux"]. Whitaker noted that there was support for homeowners on both sides of Packard for inclusion in an historic district. He was concerned, however, about the committee’s obligation to those who lived north of Packard. He worried that if they recommended an expanded district, that the city council, faced with a choice of voting it up or down, would vote it down. That, he said, put those to the north of Packard at risk. The general understanding of the committee is that council would likely approve a recommendation that was limited to the orginal study area. That view is supported by councilmember comments that were made at the meeting when council established the study committee. Said committee member Kristi Gilbert at one point, “If they [the city council] were inclined to vote for it [expanded area], they’d have made the study area bigger.” She encouraged the committee to recommend the smaller area as an historic district. Susan Wineberg said that her assumption all along in doing the research on the area south of Packard was that they were going to recommend that area for inclusion in an historic district. Patrick McCauley noted that the key was to meet the definition of the boundaries, and that to him, the original boundaries made as much sense as the boundaries of the expansion they were considering. At the committee’s December meeting, when they voted on the question of recommending an expanded district, it was a 3-3 split, with Sarah Shotwell absent from the meeting. Voting for the larger district: Ina Hanel-Gerdenich, Susan Wineberg, Tom Whitaker. Voting for the smaller district: Kristi Gilbert, Patrick McCauley, Rebecca Lopez Kriss. The committee will meet again in January and try to resolve the issue of recommending a district larger than the study area, plus report out on additional reasearch that needs to be completed. The consultant, Kristine Kidorf, will then complile the report for comment by the state office of historic presevation. As always, your coverage is so far above and beyond anything previously available it astonishes me. Thank you.